Home & Index | Email Me! Cau Mau, Mekong Delta, RVN. 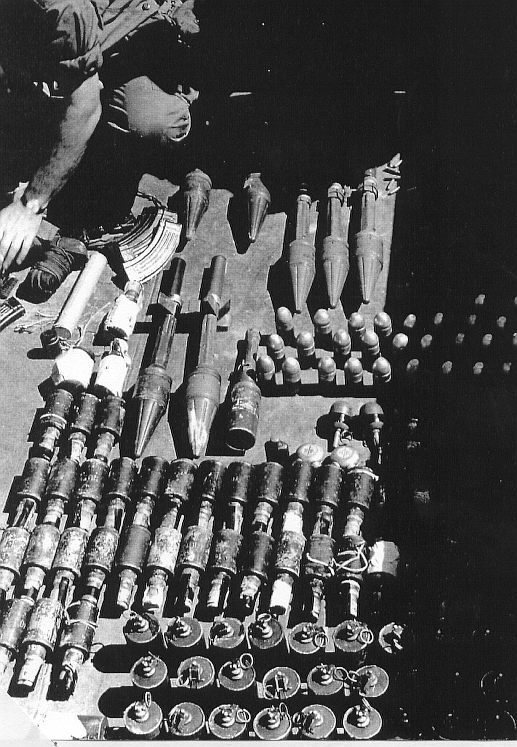 A portion of the recovered 2.75 inch FFAR warheads, motors, launchers and small arms ammunition. These munitions have been subjected to fire and immersion in water, and are hazardous and unserviceable. The motors and small arms will be exploded into the ground, but the White Phosophorous (WP) warheads will be exploded up into the air to allow the WP to burn itself out. Cau Mau. 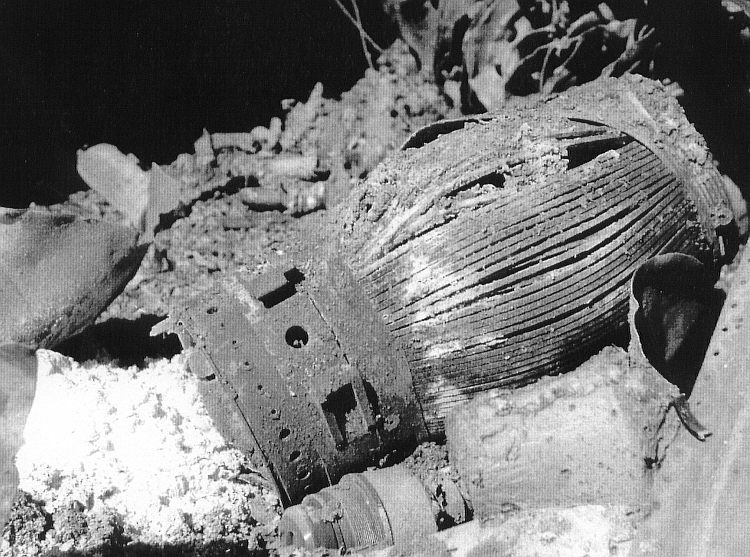 The detonation of a portion of the recovered 2.75 inch FFAR motors and WP warheads. The WP is the white burning in the center of this photo. US Army Long Binh Depot, RVN, October 29, 1966. 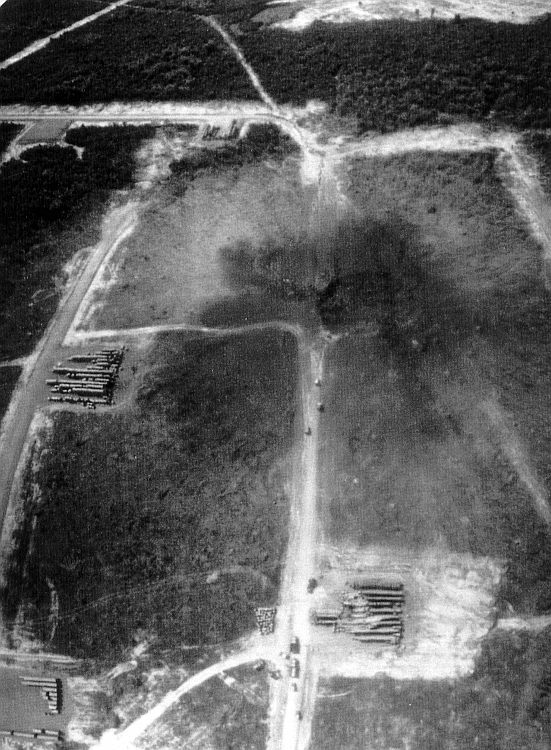 An aerial view of a very large crater left from a stack of 12,000 eight inch high explosive artillery projectiles follwing an explosion caused by the Viet Cong. The cleared area just visible at the top is the vital Army Communications Antenna farm, where the 7th AF EOD team recoverd over 200 of the projectiles. At Long Binh Depot. SSgt. 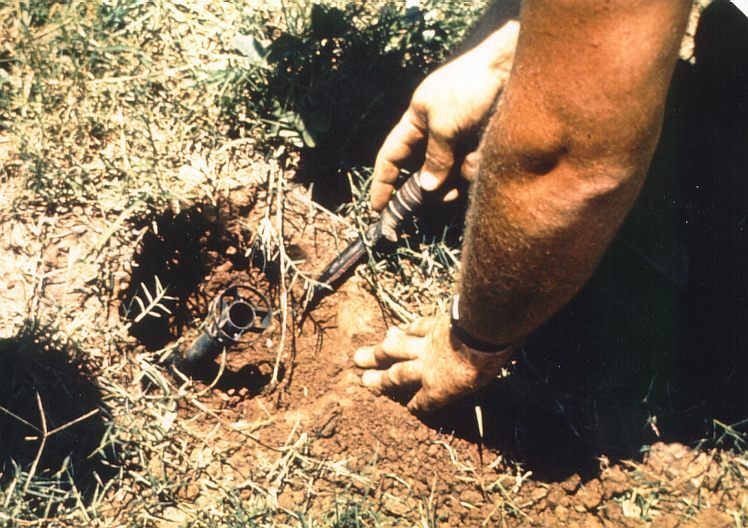 Bartram digs to recover an eight inch artillery projectile from the communications antenna farm. 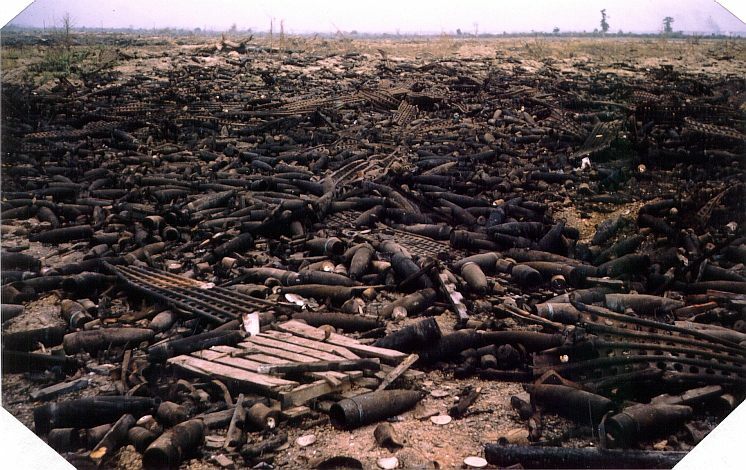 The VC destroyed aobut one-half of a 12,000 projectile stack and scattered the other half over the depot. 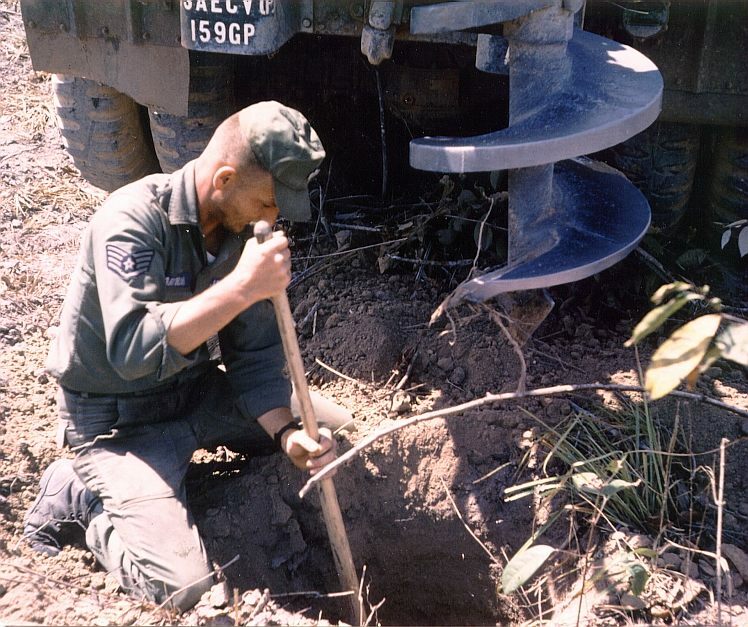 Shovels, ditch diggers and pole augers (shown here) were used to dig down and recover the deeply buried projectiles. Thu Duc Explosive Disposal Area. The blast from ten 120-pound Photo Flash bombs. 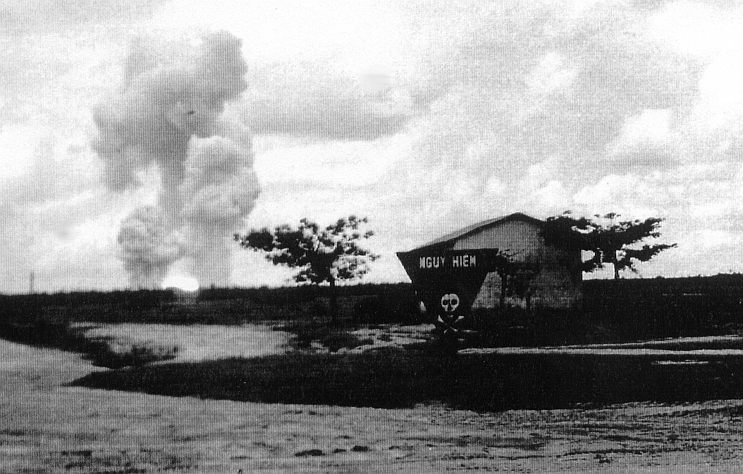 Prior to setting up this demolition, 7th AF EOD personnel were engaged in a fire fight with Viet Cong who had attacked the control building in the foreground, wounding three ARVN personnel. Pleiku AB. A CBU-19 dispenser. 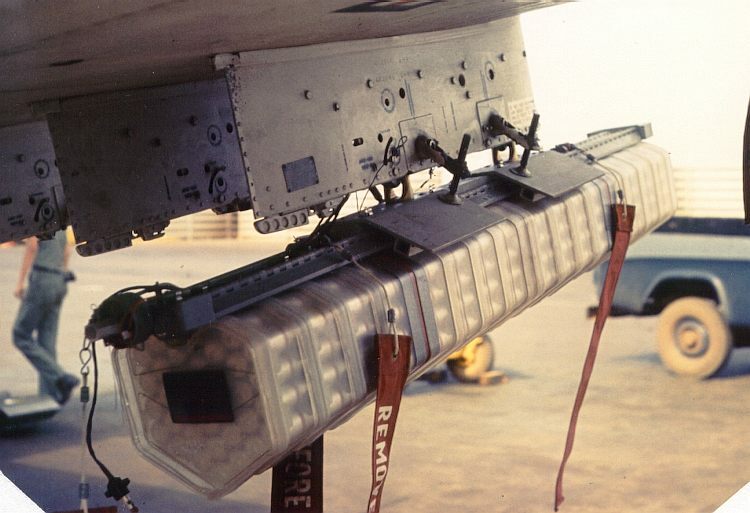 It carries several hundred E-158 CS (tear gas) bomblets that, when dispensed 'skidder' or scoot all about the area emitting gas. Used extensively by the propeller driven A-1 "Spad" attack aircraft. Da Nang AB. A Russian made 140mm unguided rocket, its fuse, and the simple but effective launch tube. The rocket is about 4 feet long. The warhead contains about 10 pounds of high explosive. The fuse is fired on impact. 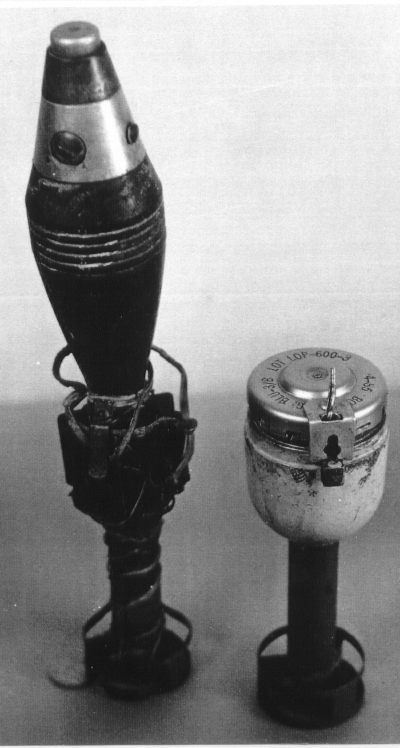 The luanch tube is aimed at the target, anchored to the ground, the rocket inserted and then fired electrically by an ordinary flash light battery. Da Nang AB. The Continuous Rod Warhead (CROW) of an AIM-7 SPARROW missile that had been loaded on an F-4 aircraft hit by a 140mm Russian made rocket. The white residue is the warhead's explosive, which is now very hazardous, having been partially burned and exploded. The item in the foreground is what remains of a partially destroyed 500 pound bomb. Da Nang. After the 140mm rocket attack. 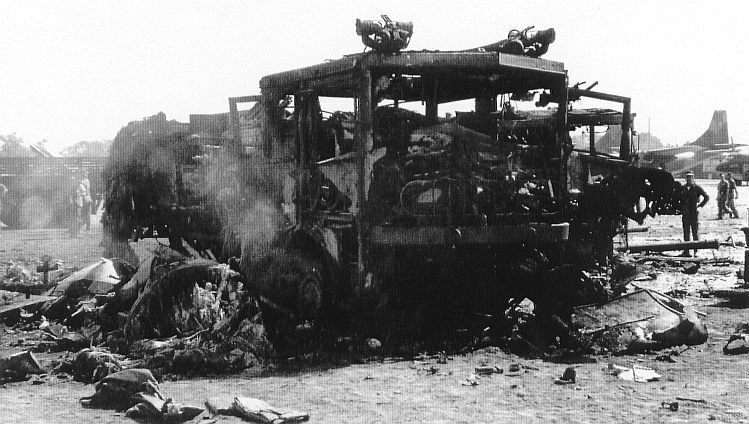 As this Air Force fire truck drove up to attempt to put out the fire on a burning, bomb-loaded F-4, one or more 500 pound bombs detonated, killing five firemen. The truck was a Type 0-11A manufactured by American LaFrance out of Elmira NY. They were purchased only by the Air Force around 1954. About 1100 were made. This is the only know loss in combat (thanks to Art Williams for the information). Da Nang. A direct hit by a Russion made 140mm rocket on a C-130A used as an airborne command post for Rescue Operations. Just one of several direct hits by the VC during attacks against the AB. Tan Son Nhut AB, December 4, 1966. 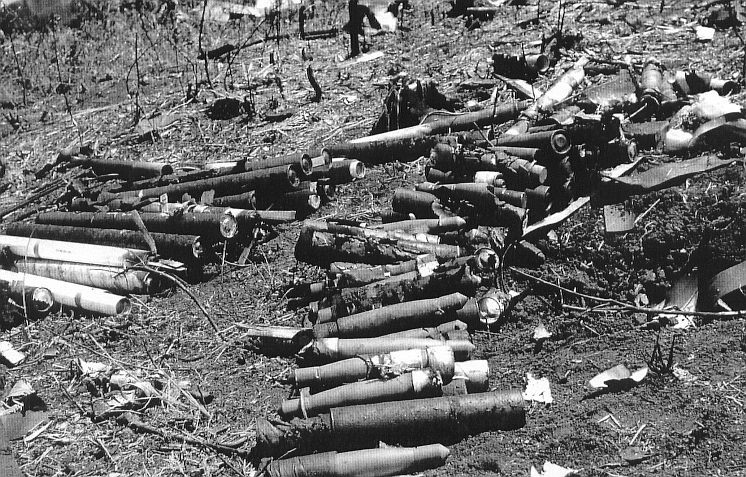 A portion of the explosives removed by EOD personnel from dead, wounded or captured Viet Cong during their attach on the base. 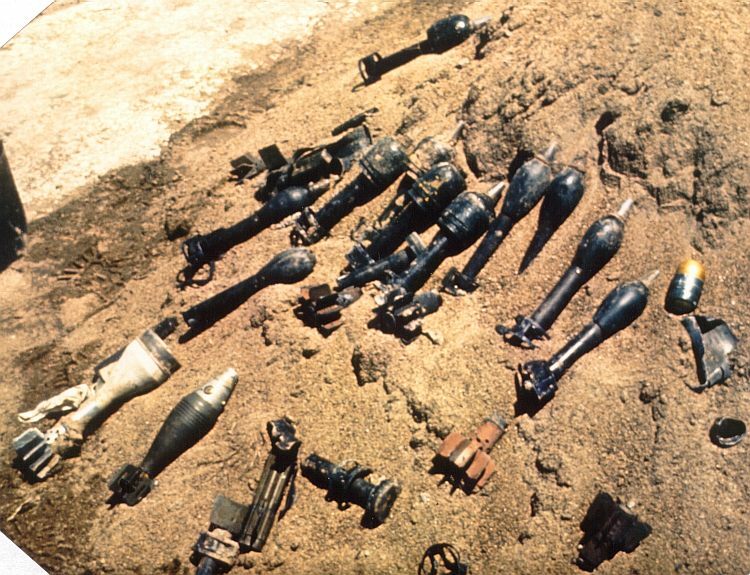 Include are Rocket Propelled Grenades (RPGs), US 40mm projectiles, and numerous home made hand grenades. Tan Son Nhut. 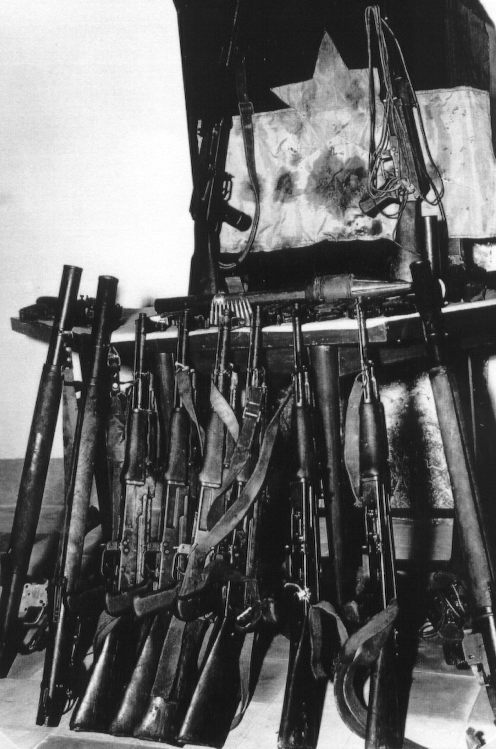 A portion of the Viet Cong AK-47 assault rifles, RPG-7 launchers, and a flag captured by 7th AF EOD personnel during the attack on the base. From captured VC photos. 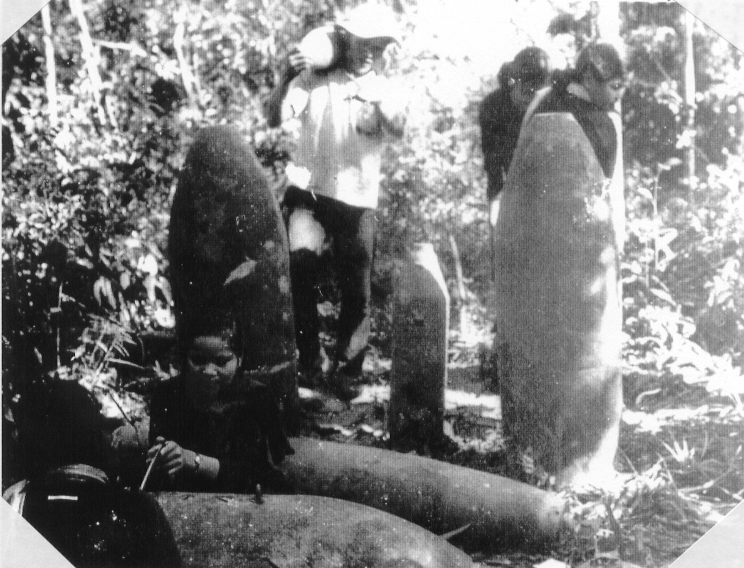 A primary source of high explosives for VC clandestine munitions was retrieved 100, 500, and 750 pound US bombs that failed to detonate when dropped. In the foreground, two VC are sawing open a 750 pound bomb to gain access to the explosive. 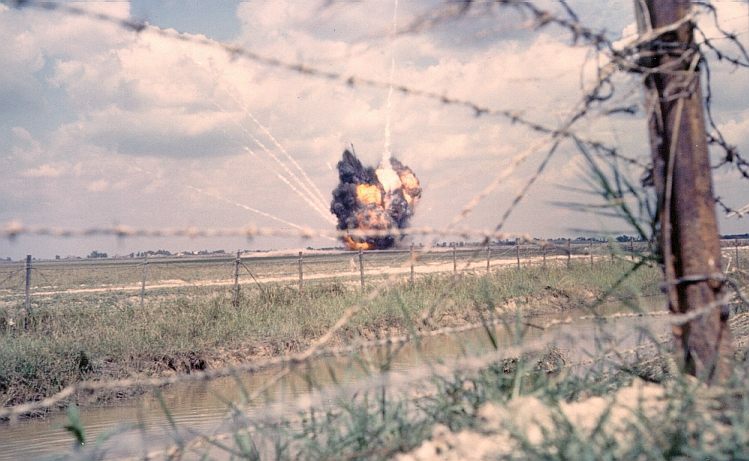 7th AF EOD personnel would try to deny this source by detonating the explosives from shot down or crashed aircraft. Tan Son Nhut. 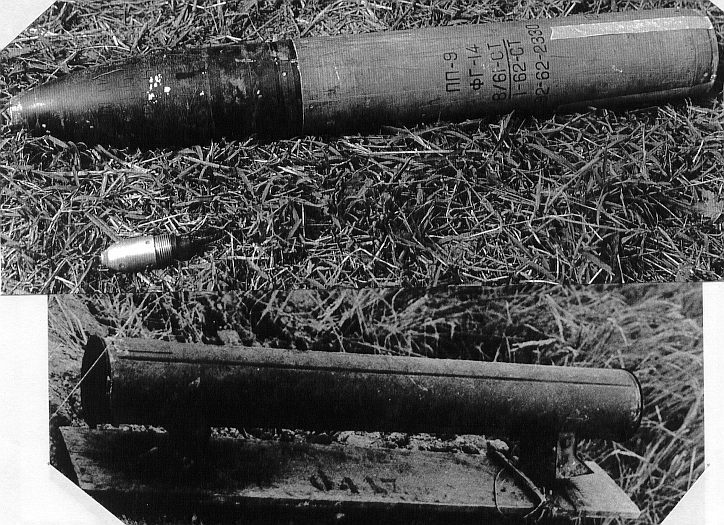 A US 60mm mortar projectile and a BLU-3 anti-personnel bomblet captured by the Viet Cong and adapted to be used as rifle grenades. These particular items were found rigged as booby traps (hanging from trees and released by a trip wire). The mortar round is armed and ready to detonate. The BLU-3 cover would come free during launch and would then be armed. Tan Son Nhut. A capture booby-trapped VC directional mine. This shows the crude but very effective construction and simple firing device. Containing less than a pound of high explosive, it could very easily destroy a vehicle or human. The mine was pressure fired when a heavy weight triggered it. The one shown here had been set to explode when a large rock rigged to a trip-wire would fall onto the mine. A grenade had also been booby-trip wired beneath the mine so that both the mine and grenade would instantly expode if carelessly picked up. Near Moc Hoa. 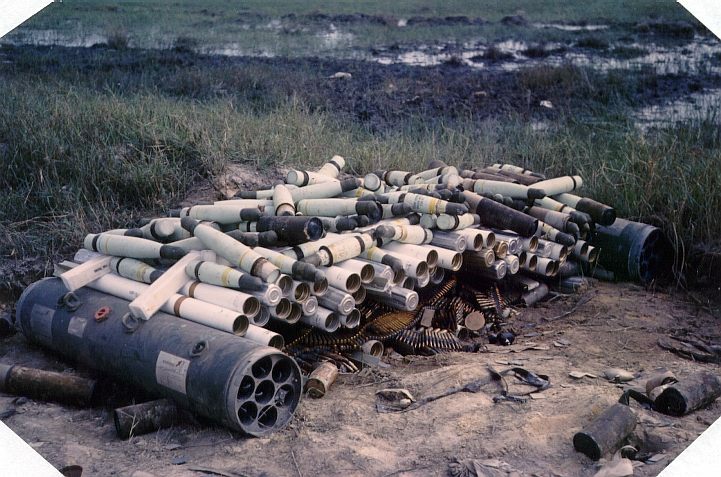 Warheads and 2.75 inch FFAR rocket motors collected by the 7th AF EOD team from a C-130 shot down by the Viet Cong. Being hazardous as well as a source of explosives for the VC, they will be destroyed. Near Moc Hoa. 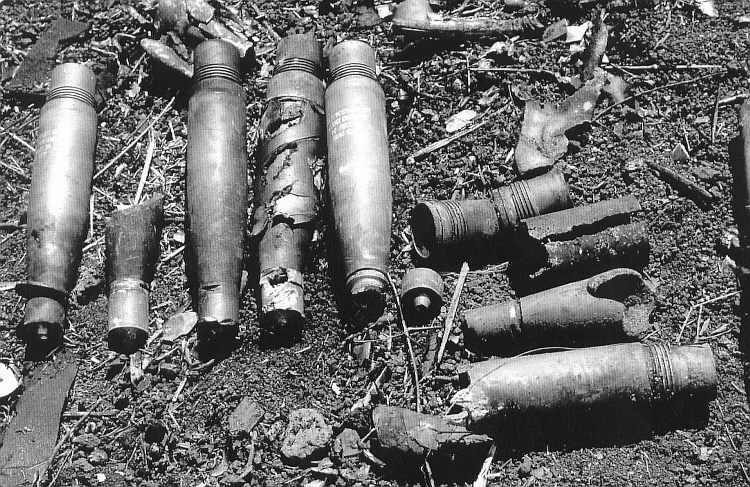 The remains of ten 2.75 inch FFAR warheads. Several have been broken open, and all were subject to fire and in very hazardous condition. At an ARVN fortified hamlet, Mekong Delta. 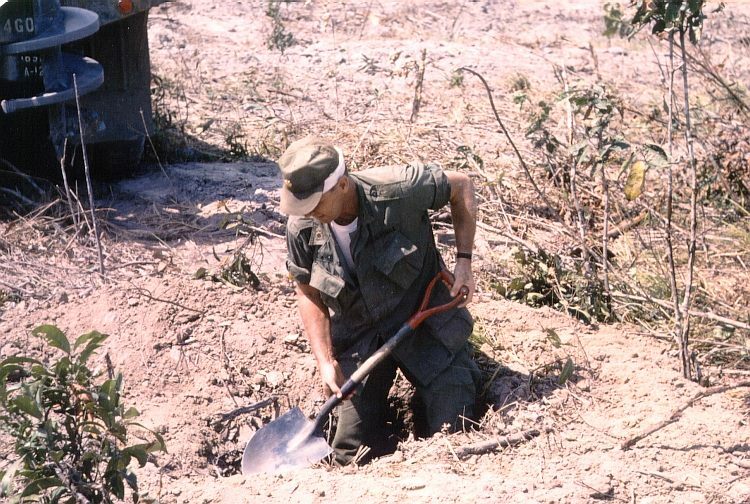 An EOD man digs out an unexploded rifle grenade following a VC attack. Considered very hazardous, the RPG will be detonated in a disposal area after its recovery. -- color photo.